Recently I saw a Facebook post that included a statement that a prominent publisher had fined a friend of a friend for using images from the Waite Coleman-Smith (WCS) deck on their website or social media page. The deck publisher had responded that this was not their policy except for commercial use of the subject images and was wrong. I knew it was wrong because, about a year ago, I had participated in a small way in bringing about a change in this publisher’s policies concerning freer use of their card images in blog and website posts. The post first referenced the Aquatic Tarot deck and then two decks that had been created by the post author as not requiring reimbursement for the use of images. I had already contacted a friend of mine, the Director of Communications for the publisher, on a shared version of this post and informed her of the post. She was not able to post directly in reply because it was a private group, so I reposted her comments and a PDF file of the publisher’s current image use policies. I included a comment that this was a poor way to market the poster’s decks since her remark about the publisher’s policies was false. 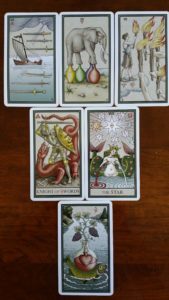 I also pointed out that the use of the Aquatic Tarot images is available under the Creative Commons license which also restricts commercial use. The post author took down all of my comments including the file containing the publisher’s image use policy and contact information for their Director of Communications. She responded to the publisher’s remark saying that she would contact her friend whose friend had said that she had been fined for clarification. She has since erased all remarks and not provided any response. So, she had been called on spreading something false and erased information providing the truth. I was left angry, but more importantly, wondering why I had taken this issue on and why it mattered to me. So, I decided to ask the cards for an answer to this question. The Sephirah Tiphareth lies at the center of the Tree of Life. It is the heart space bringing all the other disparate energies into focus. It is in the sixth position. 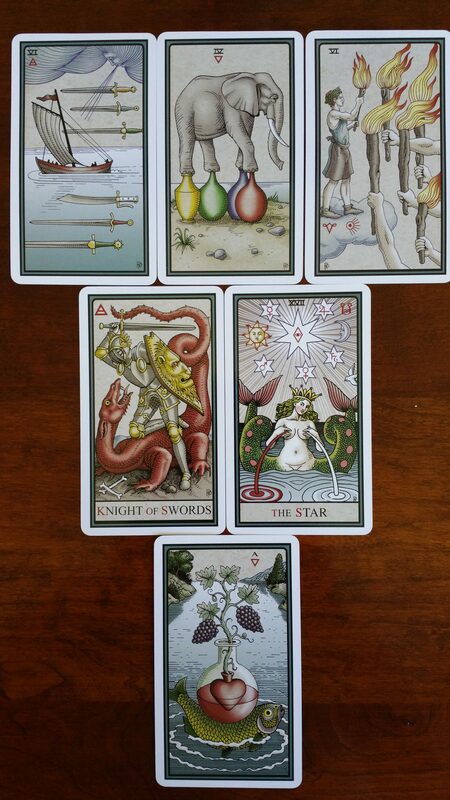 The top three cards of my spread feature the Six of Swords and the Six of Wands with the Four of Cups in the center. 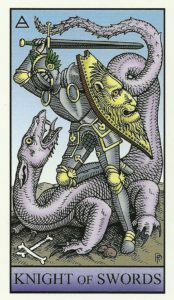 The male energies of the Six of Swords and Six of Wands are balanced in the female energies of the sixes and in the central Four of Cups. They come home and are at rest, not in conflict or ambition, but settled and balanced in Love and Understanding. 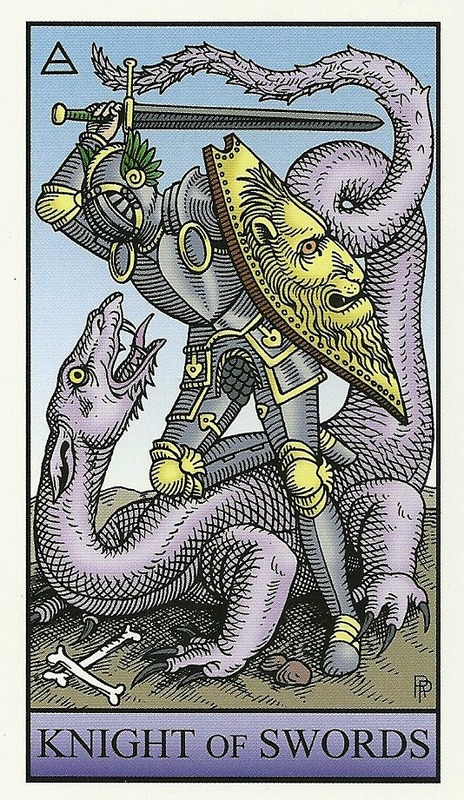 In the second line The Knight of Swords battles the dragon. This reminds me of the classic painting of Archangel Michael battling Satan, (War in Heaven by Guido Reni, 1636). This card carries both air and fire in conflict with each other. One feeds the other and they battle incessantly (or at least until Armageddon). They battle one another because that is what they know. But, when the Tower falls (Trump 16), the Star (Trump 17, which is the next card) remains. Blood and water are reconciled in this version of the Star. This blood and water are also reflected in the final card – the Ace of Cups. This is a beginning. The battle between fire and air have been quenched by water. The seed of Love grows from this reconciliation and the water becomes wine. The purpose of shining light into dark places is not to fight, but to allow the balm of Love to cleanse. A sword can win the battle, but only Love can win the war. So, shine a light where there is darkness. Hold your weapons loosely and then let them go when you can. Holding them too tightly and keeping them with you will harden your heart. You may become the problem and not the solution.